Installing audio/video speakers is easy with this set of two pairs of screw-on banana plugs. 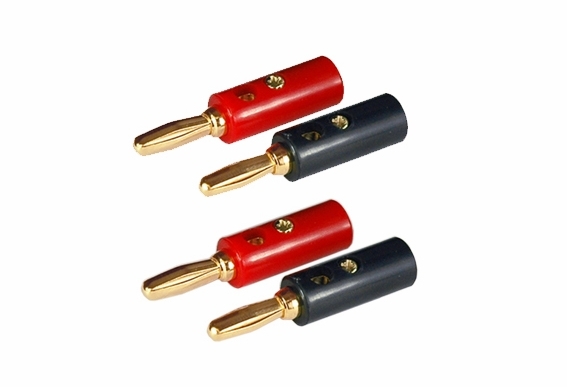 Each pack includes two pairs of premium gold-plated banana plugs, two red and two black, with rubber boots and nine individual leaf spring contacts per plug. They're made to use with 8-gauge to 14-gauge wires. To connect the wire, remove the screw at the top of the banana plug, place the bare wire onto the indentation and replace and tighten the screw. If used with banana plug jack plates, crimp the bananas to the inside of the J-box and plug into the backsides of the jack plates. Because they are designed to resist corrosion, they're a best buy for use outdoors. Our low-price guarantee means you won't have to shop around for bargains when looking for bargain prices on premium audio/video sound system wall plates, wires and plugs. Visit our how-to video page for DIY sound system installation demonstrations. 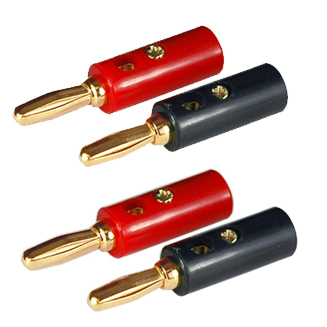 This set of 2 pairs of screw-on banana plugs (4 red and 4 black) can help speed up your installations or DIY projects. If used with the banana plug jack plates, crimp on the bananas in the inside of the J-box, and plug into the back side of the jack plates for a clean and fast installation. They feature high quality gold plating, black and red rubber boots and 9 individual leaf spring contacts. These banana plugs provide maximum signal transfer and are corrosion resistant making them perfect for outdoor. The decsription below says "this set of 2 pairs, 4 red and 4 black". Thats a total of 8 pcs. which would be 4 pairs, which is correct? And when do you expect these to be bsck in stock? Thank you. We might be a bit dense but how do you connect the wire?